And the crumbling asphalt of the open highway. After nearly four years, the zombie epidemic has almost burnt itself out. Gus’s new life on a communal farm is peaceful. The daily routine of policing the fields is rarely disrupted by straying undead. His drinking binges are over. Long days have thrown time over the memories of Annapolis. But this will all change. When Gus is asked to search for a group of missing scavengers, he reluctantly agrees. And feed it to a ravenous machine. Well Fed (Mountain Man Book 4) contains coarse language and violence. Approx. 480 pages, or 149,000 words. Now on sale at Amazon (click the cover). Audiobook edition tentatively scheduled to be released in March or April of 2015. Nice!! Hope it hits audible soon. Awesome! I’m about to finish book 3. Can’t wait for this to be available on Audible. Hi Keith, I am enjoying Well Fed an have a question about logistics. Are these real towns and road numbers yummy speak of in your books. I always like to get directions situated in my imagination so I looked at a map of Ontario and can’t spot any of the places you mention. It very possibly could be just me for I live in South-Central Mississippi and I am not familiar with Canada at all. I am at the midpoint of Well Fed and I can’t guess where the story is going. That is a really good thing that you have a major talent from. I don’t know yet if there will be another volume in this series but, I hope so. As soon as I finish this one I am going to go back and re-read them all. I appreciate your ability to describe scenes so clearly that it seems I’m in the middle of the happening. Gus is quite a character who, for me, needs a little more delving into his personality. Let me encourage you to keep up the great writing. Some places and highways do exist but some do not. And sorry, I’m not planning another book in the MM series. Book 4 really delayed my other projects and drained me from doing another zombie story. Having said that, I do have maybe some shorter zombies stories in mind but with different characters. Whether I get to them or not depends on many things, and whether the interest is there. Any idea when the audible version will be available? Your narrator does a killer job with your work,Gus in particular. Thanks for the books I lost sleep loathing Tenner. I’ve heard it should be around March or April of 2015, but you could contact Podium Publishing as well to clarify. RC Bray already has the files and yes, he did a bang-up job on the material. I’m quite happy with the audio version. Cool. sad to hear that mountain man is ending. The undead rat scourge was clever and reminded me of the game Dishonored. Would have liked to see Fist inflict more damage on Tenner so that Scott could have gone toe to toe with him. Found Buckle and grampa ninja to be an interesting pair. The fight in the van (Hellifax) was riveting stuff. Really sad to hear you’re not continuing with MM series. The character of Collie (listening on Audible not sure of spelling) is just too cool. Please consider changing your mind. 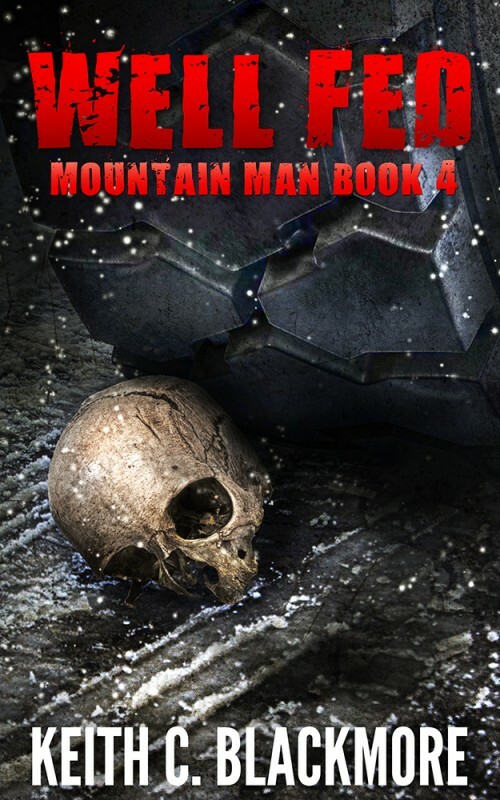 Just finished reading Mountain Man 4, and enjoyed it so much, I had to write and tell you. Read the whole series. Fabulous, marvelous work. Thanks for writing it. Followed the whole MM series on audible, it was splendid, you have a rare talent for captivating- description. As a reader I feel that I was part of the story. How did Nolan survive the zombies in Hellifax? The last time we heard of him he was underneath a pile of zombies and had been bitten. Then he turns up as one of Shovel’s men. Hmmm must’ve used the same name twice. It happens sometimes. Two different characters, however. I binge read all your books in a month and have re-read Hellifax and and MM 4 twice.You are a friend in my head dear sir.. I get your reason for putting mountain man to rest although its pure gold.gritty relate-able storytelling and genius narrative that’s refreshing.I am a bouncer and I listen to it on headphones while rag dolling and throwing out drunks at my bar.I’m a little gentler on them no always wondering if there is an Augustus among me.I love the Collie character however and would love to read more about her badassdom.Im saving up some money for Breeds and would like to just say keep doing what your doing brother! Jeez Miles–I might’ve been one of those drunks ;). Glad you liked the books and thanks for taking the time to write up a note. All the best.